We are a group of Y6 Exhibition students inquiring into puppy mills and how to support homeless animals. We are going to host a donation drive for any old or used dog items that you might have at home, all the donations will go to the Hong Kong Dog Rescue (HKDR). We are looking for things like old dog beds, old toys, dog leashes and collars or harnesses. 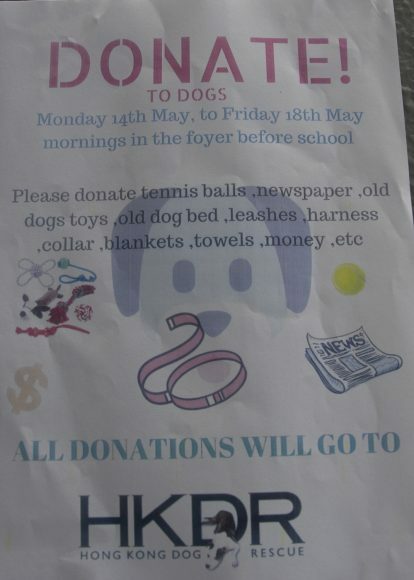 If you don’t have a dog you could donate things like tennis balls, towels and blankets. We will be downstairs in the Foyer in the mornings before school from Monday 14 May to Friday 18 May. You are most welcome to give us money as well to donate to the HKDR.